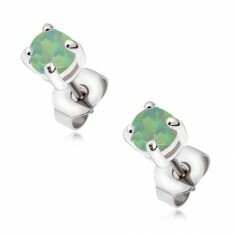 Your favorite product: Steel puzetové earrings with light green stone SP10.06 - is added to the wish list. Earrings made of surgical steel, puzetové, the stone of pale green color adherent four grips. Your favorite product: Bracelet made of steel, rectangular articles of silver and light green colors SP29.10 - is added to the wish list. Stretching bracelet made of surgical steel, articles of silver and green colors with glitters. Your favorite product: Earrings made of surgical steel, gold color, purple and green cubic zirconia S85.01 - is added to the wish list. 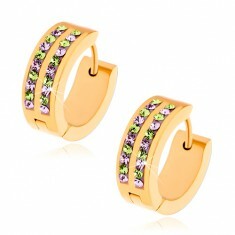 Steel earrings gold color, mirror shine, alternating light purple and light green rhinestones. 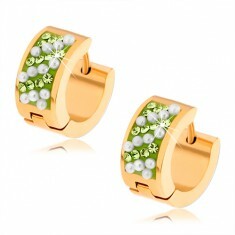 Your favorite product: Steel earrings gold color, light green rhinestones, white beads S78.20 - is added to the wish list. The articulated earrings of steel, gold color, high gloss, alternating oblique lines of pale green zircons and white balls. Your favorite product: A fake ear plug made of steel, silver in color, spiral glow in the dark PC07.23 - is added to the wish list. 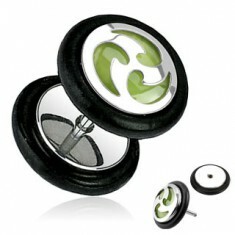 A steel fake ear plug, wheels, silver paint, three light green spiral of glowing in the dark. Your favorite product: Black circular stud earrings made of steel, the two lines of light green stones S79.20 - is added to the wish list. 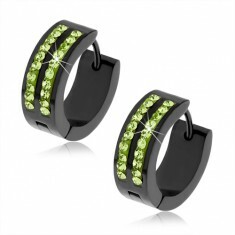 Articulated steel earrings black color, two strips formed with gleaming, pale-green cubic zirconia. 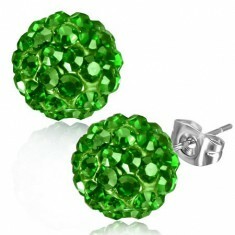 Your favorite product: Shamballa earrings, made of steel, marble, bright green cubic zirconia, 8 mm SP38.16 - is added to the wish list. Steel earrings, Shamballa beads inlaid with light green cut stones, puzetka. Your favorite product: Puzetové earrings made of steel 316L, black mustache on žlutozeleném substrate SP42.09 - is added to the wish list. 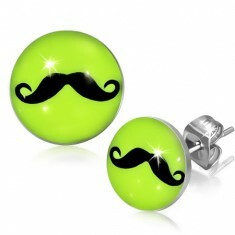 Earrings made of surgical steel, encrusted with the picture of a twisted mustache, puzetové fastening. Your favorite product: Piercing to the belly, surgical steel, dream catcher, black and green color, cubic zirconia SP28.29 - is added to the wish list. 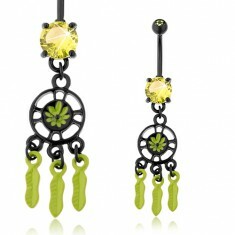 A steel piercing in belly button ring, dream catcher black color, green flower and three feathers, green and yellow-green zirkonek. Your favorite product: A steel piercing in her navel, a colorful owl, the smooth convex surface of PC06.35 - is added to the wish list. A belly Piercing made of steel 316L, shiny pendant in the shape of owls with a pink head and light green body. 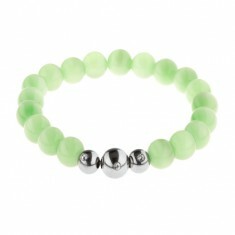 Your favorite product: Elastic bracelet made of light green round stones and steel balls Z34.15 - is added to the wish list. 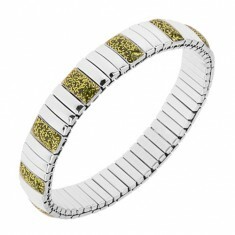 Bracelet beads light green cat's eye with a subtle pinstripe pattern, steel beads with cubic zirconia. Your favorite product: Ring of surgical steel with a mirrored sheen, pale green zirkonek HH11.12 - is added to the wish list. 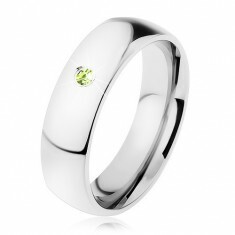 A glossy steel ring, a smooth curved shoulders, silver in color, tiny, bright green zircon, 6 mm. 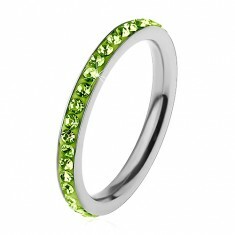 Your favorite product: Steel ring, silver color, clear and light green zirkonky HH17.15 - is added to the wish list. Ring surgical steel, silver color, alternating clear and light green cubic zirconia set into a white mass. Your favorite product: Ring made of steel 316L in silver colour, zirkonky in the light of the green hue H1.19 - is added to the wish list. A glossy steel ring, silver color, shining light green cubic zirconia blend into the mass in the same shade. 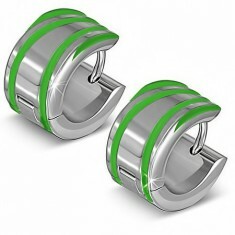 Your favorite product: Steel earrings silver color, light green strips, high gloss SP93.06 - is added to the wish list. Two-tone articulated earrings from surgical steel, green glazed stripes, a glossy and smooth surface.